As discussed in chapter 2, a LASIK procedure involves using a laser to reshape the cornea so that it changes the way light travels through the cornea and onto the retina. During the LASIK procedure, the outermost layers of the cornea are separated, creating a thin flap, which is gently folded back, exposing the stromal tissue beneath. The exposed corneal tissue is then precisely sculpted by an excimer laser into a new shape to correct your vision. The flap is set back in place and is held in position by the eye’s natural stickiness, almost like Velcro. Doing LASIK on your eyes is analogous to sculpting a contact lens onto the surface of your eye—you see clearly, but without the routine of removing, cleaning, or changing a contact lens. As explained earlier, individuals who are nearsighted (myopic) have corneas with too much curvature in proportion to the length of their eyes. Once the corneal flap is made and lifted back, the excimer laser reshapes the underlying stroma by removing more tissue from the center of the cornea than from the periphery. The result is a flatter cornea with less focusing power. The surgeon’s careful, precise measurements are programmed into the computer to guide the excimer laser. Figure 16. 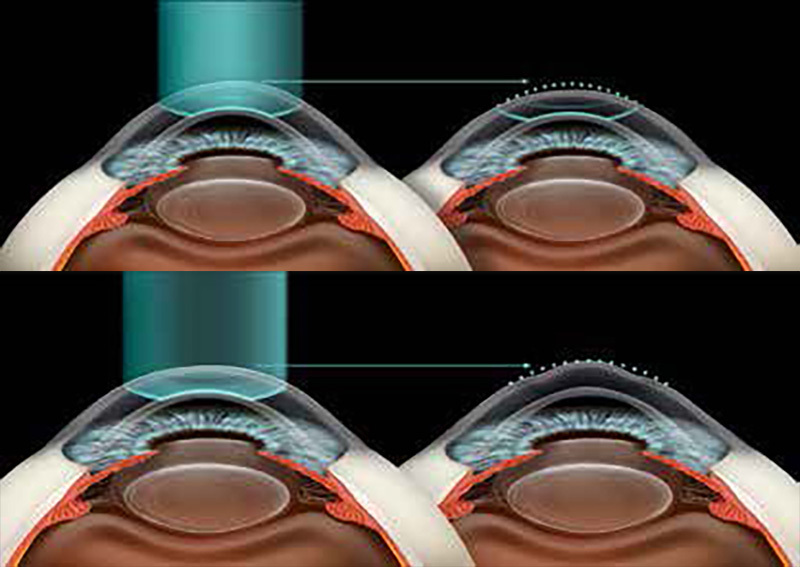 Top: To correct nearsightedness, the excimer laser removes tissue from the central part of the cornea. This reduces the curvature of the cornea and causes the incoming light to focus correctly. Bottom: To correct farsightedness, the laser does the opposite: it removes tissue from the periphery of the cornea, increasing its curvature. When the reshaping is complete, the flap is replaced. (Figure 16. Top ). The result is that light rays coming through the cornea now come to a point of focus on the retina rather than in front of it. Farsighted (hyperopic) patients, on the other hand, have corneas that are not curved enough for the length of their eyes. The excimer laser is programmed to remove tissue predominantly from the periphery of the cornea, leaving the center of the cornea untouched; this creates more of a domed shape. (Figure 16. Bottom )The increased curvature of the cornea allows light rays to focus on the retina rather than behind it. To treat astigmatism, the excimer laser removes tissue in an oval shape, correcting the shape of the cornea in one direction more than the other. The goal is to eliminate the oval shape of the corneal surface so that light rays passing through the cornea meet at a single point of focus on the retina. Astigmatism can be corrected with the laser in combination with correcting nearsightedness or farsightedness. LASIK can treat presbyopia by creating a monovision correction. We can use LASIK to correct one eye for excellent distance vision and the other eye for excellent reading vision.